ARZombi transforms your door and windows into portals to a parallel reality - one in which an Augmented Reality zombie apocalypse is taking place right outside your home. It is your job to "Board Up" the AR portals (your door and windows) and fight off the undead along with any other surprise visitors that may come your way during the apocalypse. Grab the closest weapon and collect whatever items you find on your slain zombie foes. ARZombi is a crazy thrill ride back into an 80s dystopia! 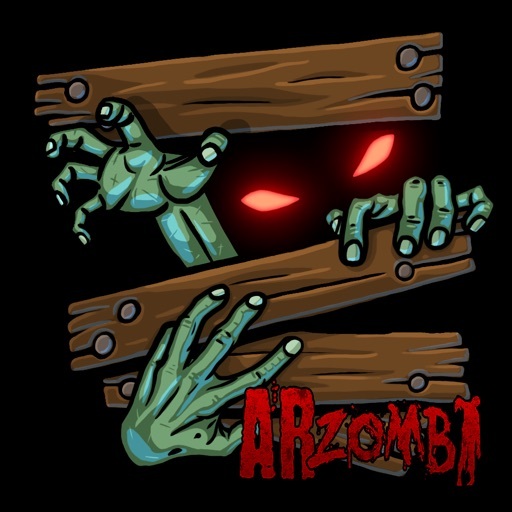 ARzombi will have you defending your house from all angles. Collect power-ups, ammo, and "zombi coins" to purchase assault rifles, shotguns, mini-guns, and much more to aid your survival. Currently, ARZombi has "Survival Mode" where you battle wave after wave of zombies as they become more frequent and harder to kill with each passing wave. Time to bring out the BIG GUNS! ARZombi stands apart from the rest as the first AR game that fully incorporates your actual surroundings. Pick a room in your home, barricades the door and windows and fight an onslaught of AR zombies that come from outside. Unlock hidden achievements and see how many waves of Augmented Reality zombies you can overcome. Will you survive? Get weapons, blast zombies, watch TV and eat pizza... What else is there to do?